If you’re a business traveler chances are that you travel with suits, jackets, dresses, and other formal clothing that needs to be packed so it doesn’t wrinkle. Enter the carry on garment bag. 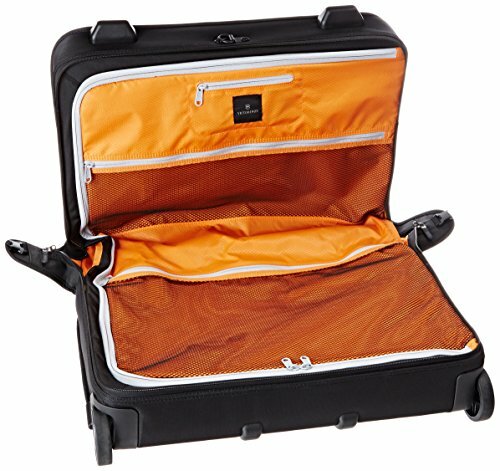 These bags are similar size to normal carry on luggage but are designed specifically to contain formal and business clothing. Think of it as a carry on specifically for these clothes. There are two main types that we recommend. One is a roll-aboard carry-on style bag and the other is a tri-fold bag which is meant to be carried by hand or over your shoulder. Both work well, but it just depends are your personal preference. 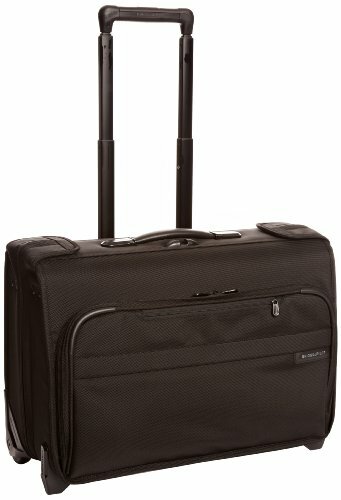 Today we are rounding our our top 10 best carry on garment bags for travel. Why use a garment bag as a carry on luggage? If you wheel these guys on the plane, you will be taking this bag as either your only bag or you will be checking a second bag. 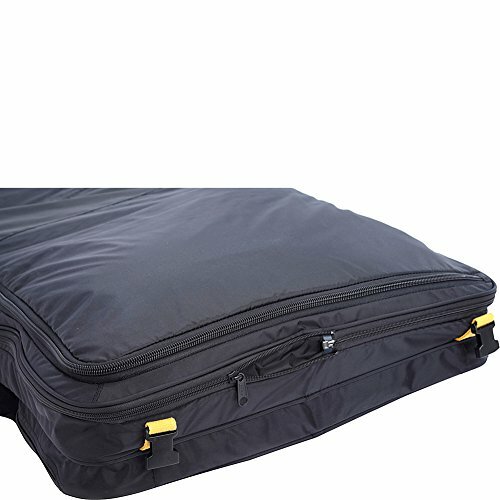 For many business travelers who do overnight trips, they can absolutely get away with just bringing a well-designed garment bag as their ONLY carry-on bag. This requires smart packing and a bit of a system. But in the end this allows you to have the best of both worlds. 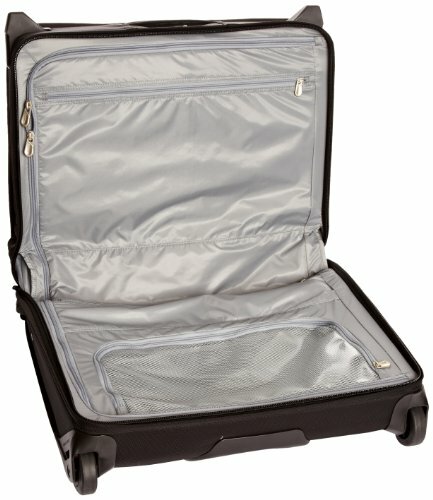 Lightweight carry-on only travel and wrinkle free clothing. This is crucial if you are arriving the morning of a big meeting and need your clothing ready to go and intact right when you arrive. It’s pretty simple really. 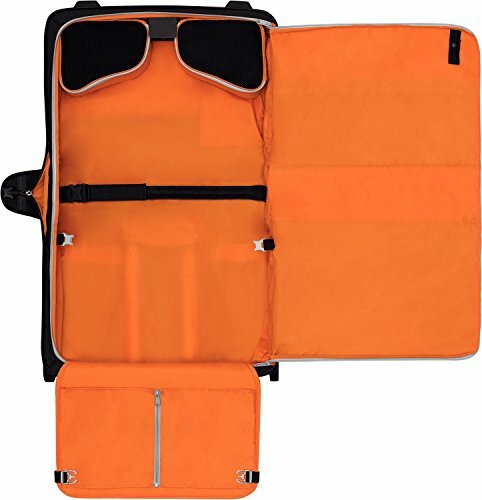 For wheeled garment bags of the carry-on style you basically have a horizontally oriented bag that has an internal setup capable of securely storing at least one suit as well as shoes and other travel accessories. 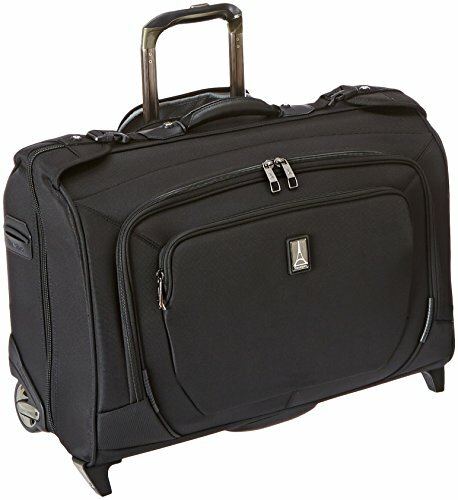 Generally it is the organization of the inside of the bag that separates garment bags from regular old carry-on bags. And most will include a hangar for your blazer, suit jacket or small dress. 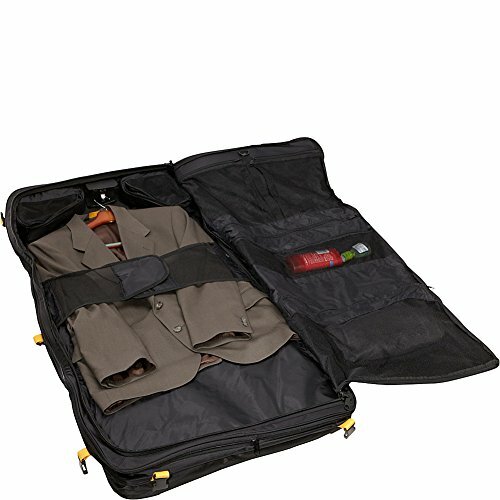 Tri-fold garment bags on the hand are design to actually contain your suit but then fold it in a wrinkle free design so you can carry your clothes like a duffel bag or overnighter. 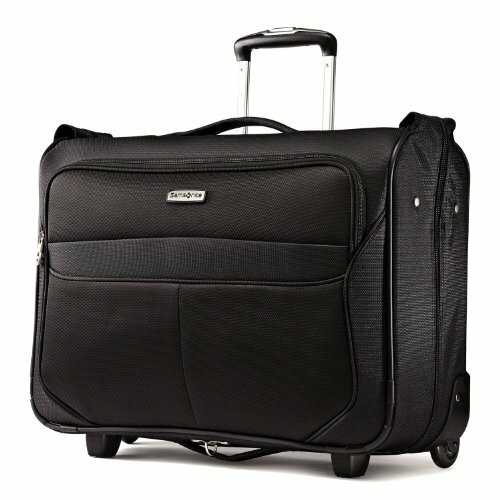 If you have the space, I’d always recommend rolling garment bags over the tri-fold or duffel style bags. 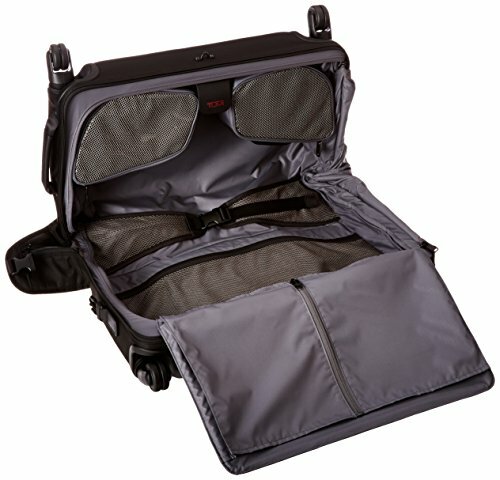 This is because the wheeled bags have ample room for other stuff like a computer or few extra accessories. Here we go. 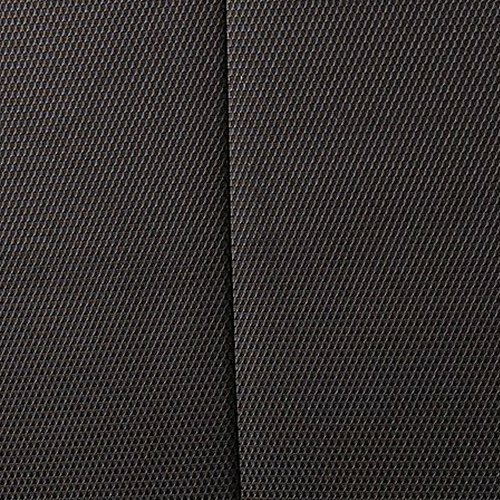 This is what we consider to be the creme of the crop in the garment bag space. 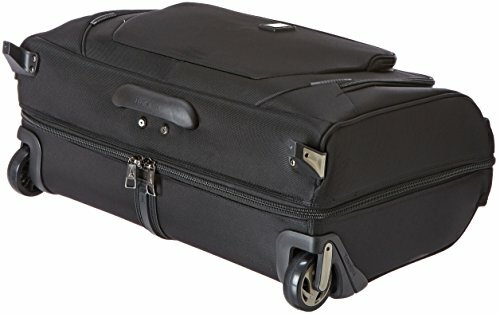 Most of these are rolling suitcases that can double as normal carry-ons but we also included a few of the best tri-fold garment bags as well. This is the bag we recommend over all other bags. 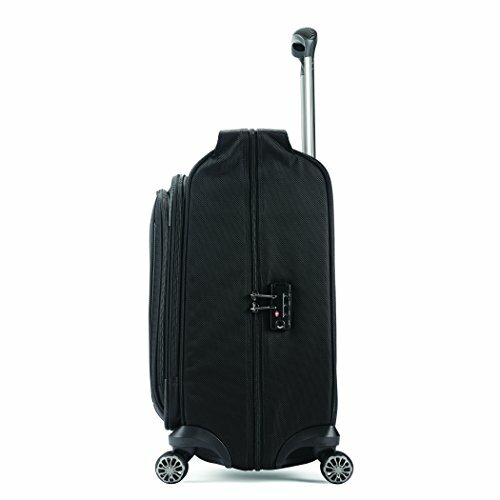 First of all, it is made by Briggs & Riley, widely known as the Cadillac of luggage. Their quality is heads and shoulder over everyone except for maybe Tumi. But its the design that really makes this bag. The horizontal design allows the bag to be more easily stowed on the aircraft. While the inner design has room for shoes bags, a sturdy suit “wally clamp” big enough for two full suits and various other zippered garment bags. 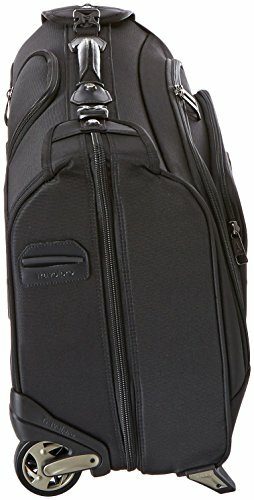 Couple that with Briggs & Riley’s awesome outsider pull bar design which makes the inside of the bag totally flat, and you have a fully premium carry on size garment bag. We just had to put this bag on the list. 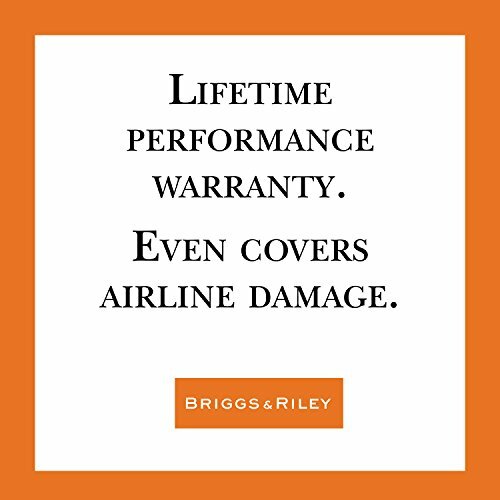 This is an upright style garment bag from Briggs & Riley. Meaning that the suit itself is stored vertically. Made of 1680 ballistic nylon, this bag is ready to take decades of abuse on business trips. There is a large space to store suit jackets and pants and a large zippered pocket for other items. Again, this kind of bag could easily be considered your ONLY carry-on since it is designed and laid out so well. The end dimensions of this bag are just about the same as the horizontal brother above. 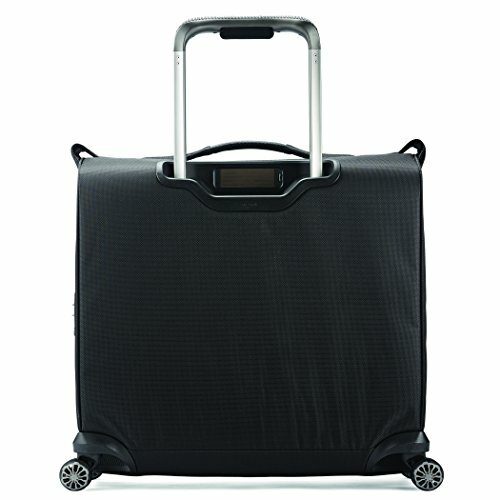 Breeze through tight airplane aisles with the convenience of a garment bag and the versatility of a packing case in this 2-in-1 wheeled, upright carry-on, the garment section holds 1-2 suits and the packing compartment is ideal for clothing and accessories. Self - repairing YKK zippers for smooth zipper action with lockable. 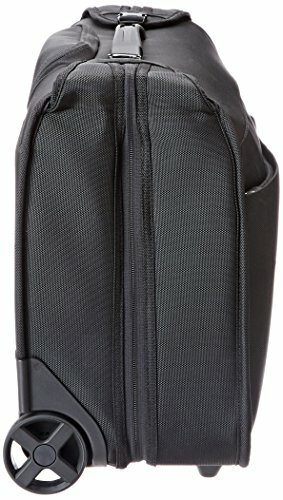 V-groove handle tubes are stronger and guarantee less jamming, outsider pocket for convenient storage of quick-access items, tethered smartlink strap transports two or more bags as one. 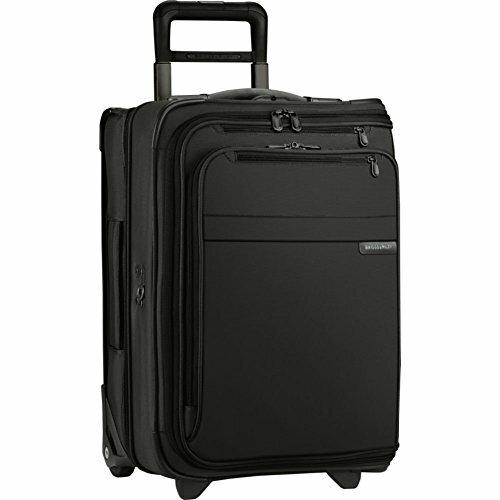 Next up is the Travelpro Maxlite 4 Carry-on Garment Bag. This bag hits the spot in terms of quality and also affordability. While it may not be as rock solid as either of the Briggs & Riley bags, this is likely the best deal in carry on garment bags. 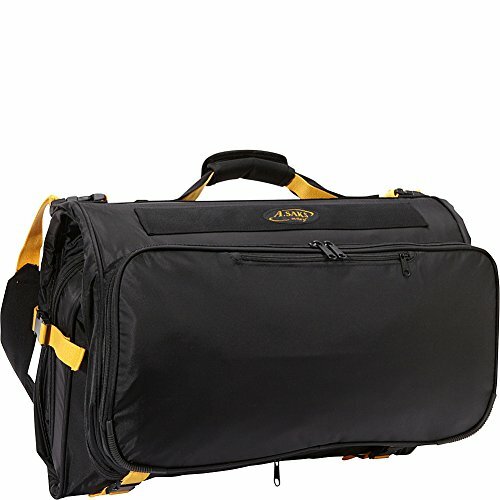 This bag has similar features for storing clothing inside to the B&R bags, a water resistant coating across the whole bag and an excellent telescopic handle that carries over from Travelpro’s other carry on designs. 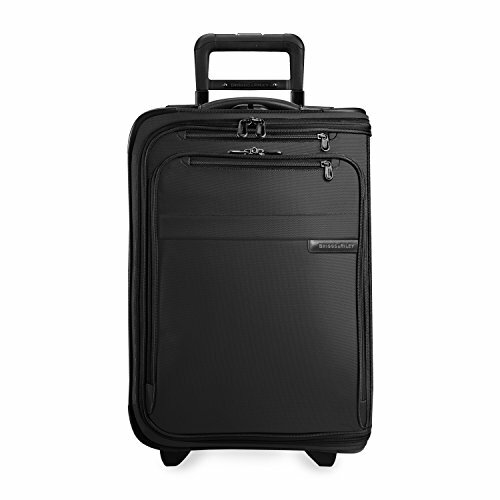 This bag is just as good as the Travelpro Maxlite 4, but in a garment bag. Need we say more? 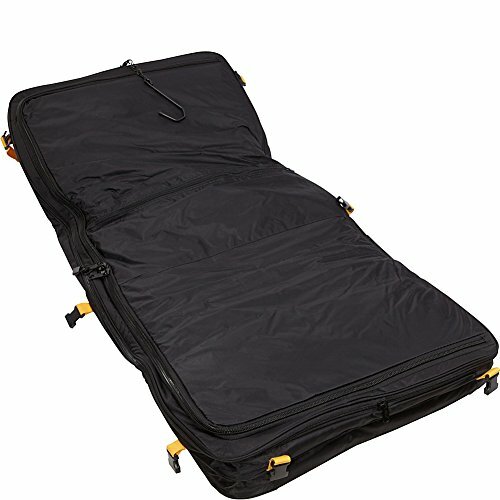 This is basically a suped up version of the Maxlite 4 garment bag above. It is oriented towards airline crew (who you will see with garment bags most of the time). 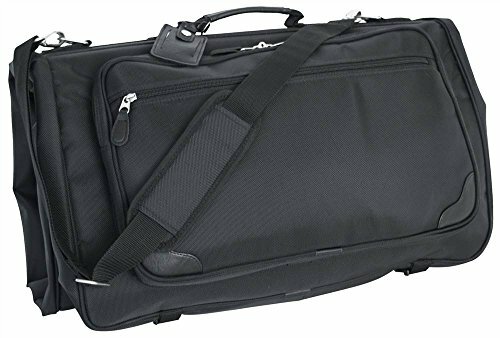 Again, this is a very well designed garment bag, featuring shoe bags, a strap in garment system, a large zippered compartment for other clothes and Travelpro’s excellent wheels and pull handles. This bag has a few more external pockets to accommodate items added at the last minute of things like jackets which may come in handy for many business travelers. This is where things get really interesting. 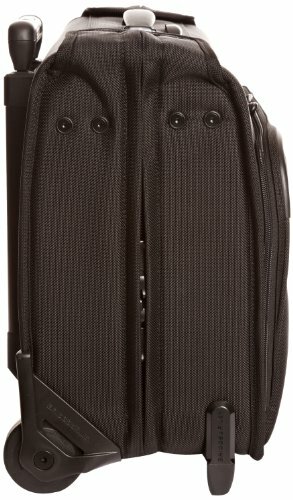 While Tumi’s garment bag offerings aren’t cheap, they give Briggs & Riley a real run for their money. 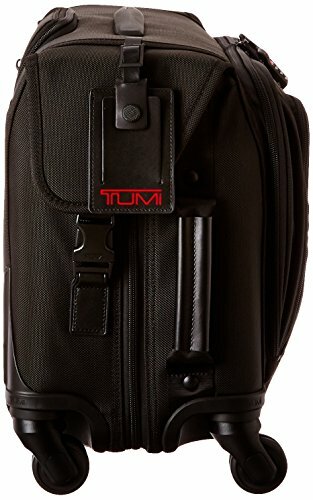 This bag, from Tumi’s Alpha 2 line, is one of the best bags of any kind we have seen. Period. The style of this bag is excellent as it always is with Tumi but the execution is where we give top marks to the team at Tumi. Ample inside space with various meshed pockets will keep all of your clothing and shoes put and wrinkly free, while the outside of the bag is adorned with solid ballistic nylon for extreme durability. 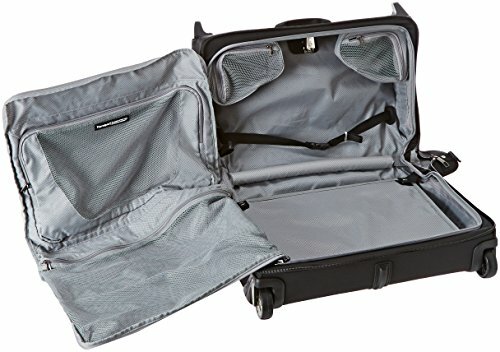 One of the things that sets this bag apart from bags like the Travelpro bags above, is that it can be turned sideways for rolling down airplane aisles. Believe me, this is not a feature that many bags can boast. And its a major time saver. Overall this bag is likely in the top 3 of all garment bags, as long as you are willing to pay a little bit extra for the privilege. This bag is an all around powerhouse. 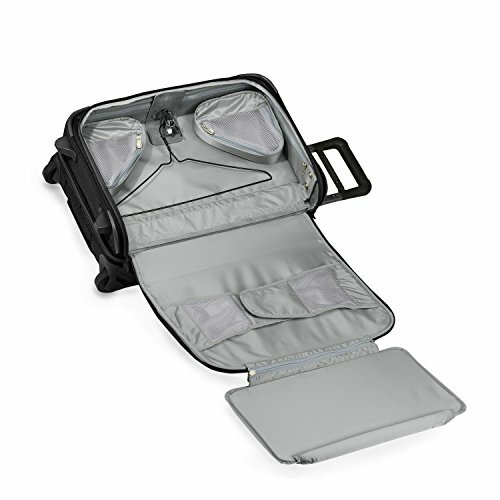 With its internal clam shell design and garment hangars / security straps, this bag will stay extremely organized. 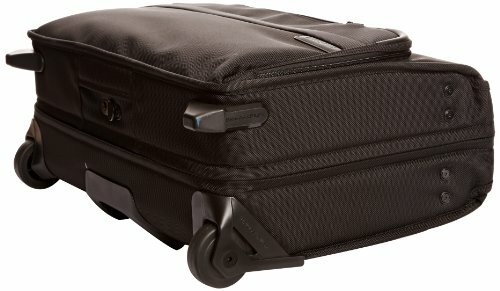 The wheels on this bag are excellent, even though it is only a two wheel design as opposed to many of the spinner designs like on the Tumi. 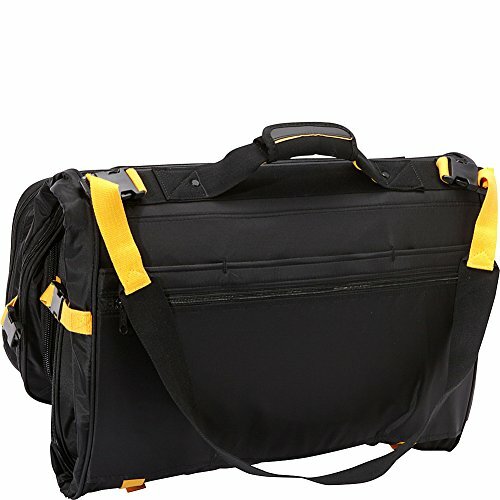 Overall, this is a great middle of the road bag for a good price. 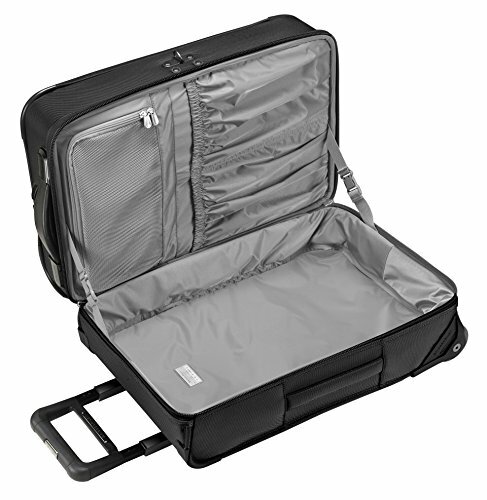 If you don’t need to secure formal or business clothes, consider a nice set of packing cubes where you can roll up and organize your clothing. 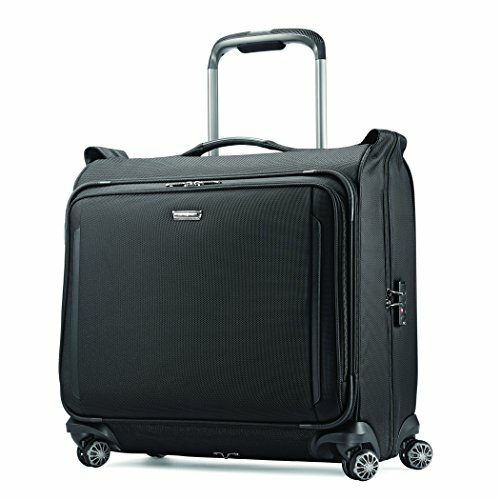 The first of two Samsonite entries on this list is the Samsonite Silhouette Voyager garment bag. This spinner bag is a little bigger than most gament bags, which may get you in trouble on smaller regional flights. Don’t be surprised if this needs to be gate checked from time to time. But you gain some valuable space inside the bag for stowing just a few more extra items. I would stick to the Travelpro for a more budget pick over this bag though. And if you have the money, consider the jump to the Briggs & Riley or Tumi bags. The Samsonite Lift is probably the better of Samsonite’s garment bags. 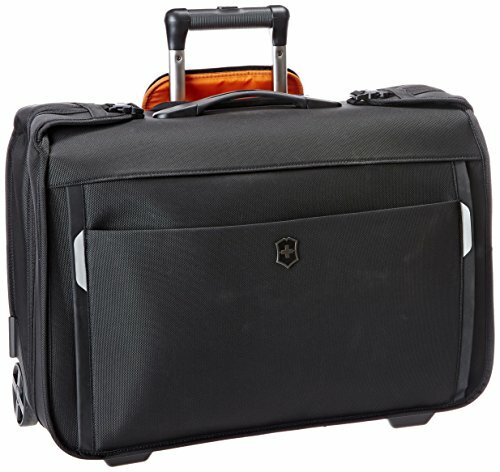 It is true carry-on size and boasts excellent organizational design on the inside of the bag. There is a bit less useable space on this bag due to the pull handle taking up valuable real estate in the bag. But other than this oversight, this is very good contender for the top 5 best garment bags out there. Now onto the tri-fold style garment bags. 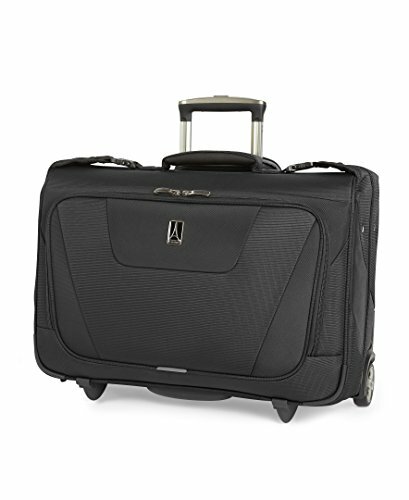 One of the best around is the A. Saks Deluxe Expandable Tri -Fold Carry-On Garment Bag. This bag is made from durable ballistic nylon and is extremely lightweight. One could imagine using this bag as your personal item (it may be a stretch, but I can see it working). There is an over the should strap to keep everything comfortable and a number of other secured pockets for laundry and other items. 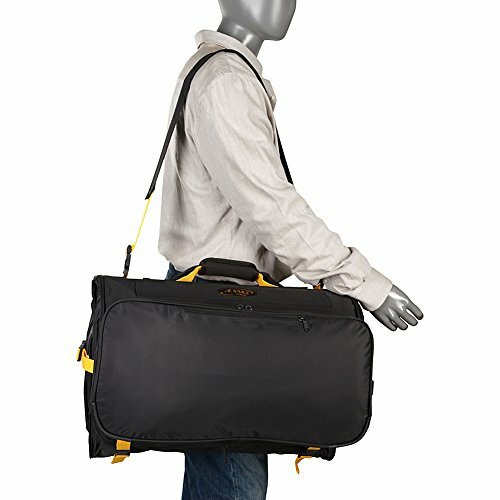 If you are looking at tri-fold designed garment bags, this should be on your list. 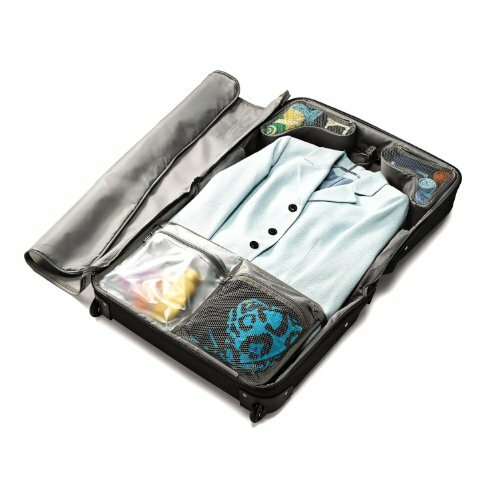 If you still want a garment bag but want to stay on the affordable no-frills side of things, consider the Mercury Signature Series. This bag is also made of ballistic nylon and features ample spots to stuff gear. It has a very nice professional design to it which would make this an easy addition to any traveling business person’s bag line-up. That’s it for the top ten. 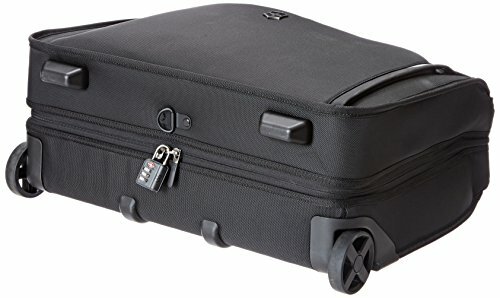 Again, if you want to “one bag” it, consider one of the wheeled carry on garment bags as you will be able to fit everything you need for a short trip in any of them. 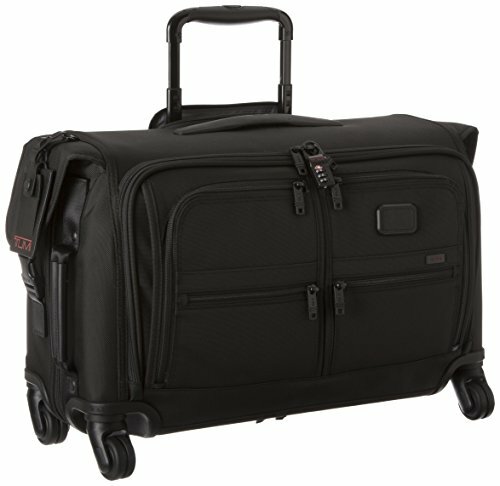 Briggs & Riley are Tumiour top picks for sure, but Travelpro makes an excellent product for a very reasonable price.